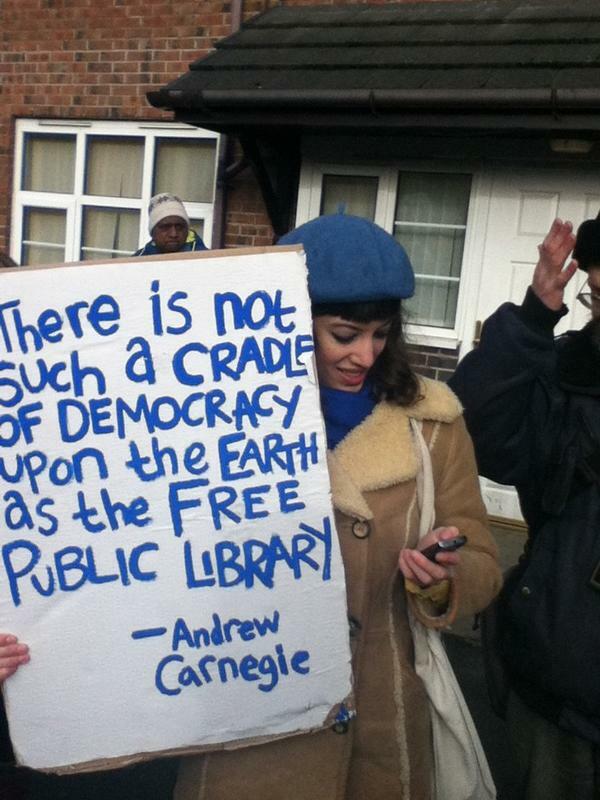 If you can’t make it down to the Minet Library, you can still tweet a photo to Jane Edbrooke, Cabinet member responsible for Libraries (@JaneEdbrooke) and your local MP with the hashtag ‪#‎SaveLibraries. If you do not have a twitter account, send the photo to us at Save Lambeth Libraries and we will send it out for you. 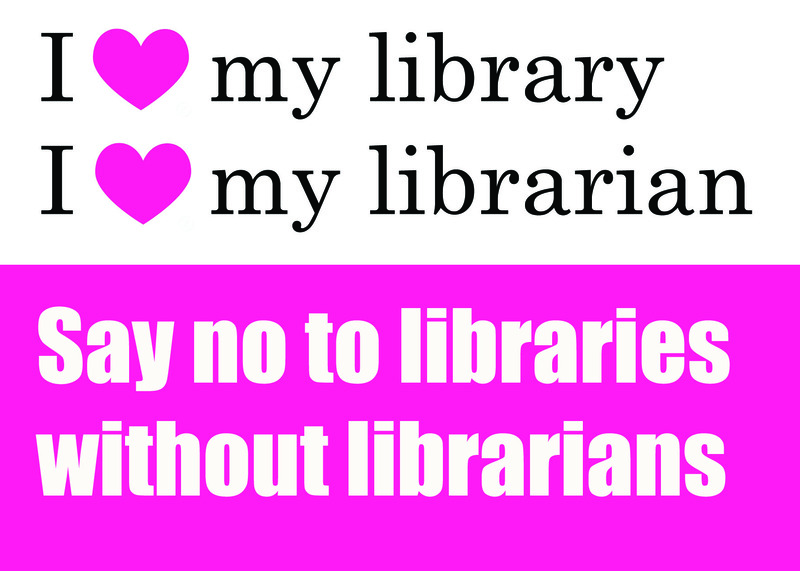 Want to help us support our local library service which is under threat from years of budget cuts? Take 5 mins right now. We need your help. Step 3: Write to your local Councillor or MP online asking them to support the manifesto. This takes no more than 5 minutes and is all done online. No stamp-licking required! Step 4: Share it around friends/family/community groups/trade unions and ask them to do the same. Step 5: Put our next planning meeting in your diary and help us build the campaign. Thursday 5th Dec, 6:30PM, Vida Walsh Centre, Brixton. • A wide-ranging, quality book stock available to borrow without charge. • Up-to-date ICT that is available to access free of charge and without restrictions, supplemented by support from trained staff. • Access to e-books remotely and without charge. • A wide-range of quality online services at no charge. • A space free from commercial influence. • Dedicated services for teens. • A service managed and run by professionals. • Volunteer opportunities but only as a support to paid staff, not as a substitute. • Library buildings that provide a modern, welcoming space. • A service owned by the public, not private companies or a sub-section of the community. 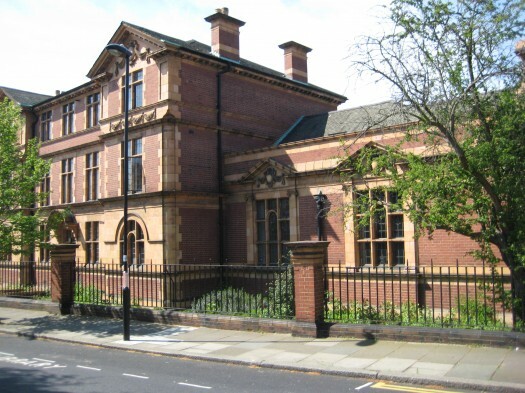 We note that, although Lambeth Council have invested in Library buildings, budgets to run Libraries have been slashed to the point where they can no longer provide the service Lambeth citizens need and deserve. Lambeth residents deserve a Library service equivalent to that provided for residents in neighboring London boroughs with adequate levels of staffing, digital access and books. Ask your local politicians to commit to the Lambeth Manifesto for Libraries. Leon can you tell us the background to the occupation? Twenty months ago Barnet Council announced their plans to shut the library along with a couple of others in the borough and almost immediately there was massive opposition to it. The Save Friern Barnet Library Group started up. Then in April of this year the Library was given 24 hours notice of shut down. So it happened really quickly. Within 24 hours there was a sit in for five hours. The security wouldn’t let anybody go to the back to use the toilet and nobody was experienced in sit-ins – they hadn’t come with supplies so they left after a few hours and the library then was shut for five months. Around the beginning of September a group came in because they’d been reading about the library being shut. They were interested to see if they could start a project where they would occupy and live and the building with part of it used as a library. But because there’s really no space for living here the first thing they did was to contact a couple of people involved in previous Occupy projects and said “listen we’ve just got into this building, its really beautiful, and is really dear to locals hearts.” I’d been watching the campaign getting a lot of coverage in the Guardian, so I came straight away. So how did you involve the community? We had a meeting with Save Friern Barnet Library Group. They wanted to meet us because they were getting strange advice from their legal advisers, like if they came in they’d be liable for court costs. The two Labour Councillors in this ward have been really supportive here. They didn’t want to step over the line at the beginning but once they realised the legal advice was a bit of overkill a lot of people got involved. So that happened around the 5th Sept. On the 7th we opened for the first day. The locals had been holding pop up libraries outside so they held it inside and the process began. We started meeting with the library campaign. With the occupiers there was four or five of us at the time. We had a real desire to not let our own agenda take over at all. Just to see if we could mobilise what was happening here as much as possible. There was already a Borough wide campaign? There was a Save the Library Campaign, and also a very strong local campaign, the Barnet Alliance for Public Services, against the councils One Barnet programme. This plans to privatise a huge amount of public services and a lot of those people came in. Barnet Alliance have been helping here since the beginning and we’ve tried to develop a relationship. 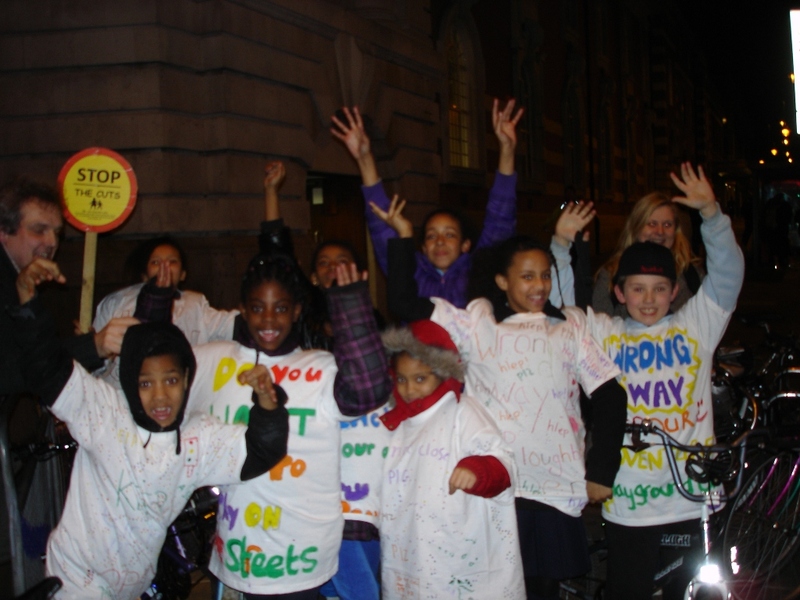 Some of them came down to when we were occupying at St Pauls. I didn’t know any of them then but there’s been an actual affinity between the caretaker occupiers here and Barnet Alliance. We’re on the same page on a lot of issues. Also a lot of new people came in from the near vicinity of this Library. At first they were a little bit wary of what the squatters in the library were going to be like. But when they met us and they saw what our intentions were we kicked it off quite quickly. What we’ve been doing here has been really inspiring, seeing so many people come through the doors, to meet each other. Even people that have been campaigning in Barnet on different issues, we have been providing a space for people to come together, organise and share things. So what has been the council’s response? Within a week we had legal papers served from the council and they wanted us out. They didn’t like the idea at all. Even though the building was being left empty. It probably won’t be sold for another year at least if they get their way, but they wanted us out as soon as possible. The papers were delivered I think around 17 September. On 9 November, the Judge said this is a big trial, we need up to two days and gave us court dates 17-18 December. So that’s where we are legally now. So people sleep here permanently. Is there always someone in the building and a system to alert people? Yes we try to keep about four permanent people here. We have a text alert telephone tree. It’s not really a telephone tree, its just lots of numbers that we can send one text to all of them but we don’t have to worry about that here. We’re safe until after the court case. You’ve got thousands of books here, where did they all come from? All donated, we reckon it’s between 8-10,000. Most have been donated from the local area and we’ve had two groups outside of the area donate. We’ve had three computers donated as well, and financial donations that have enabled us to print off leaflets and flyers. The way its worked is we set up working groups at the beginning so we sort of split off into outreach events, proposals and caretaking – just to make sure that the project wasn’t just controlled by the people who were sleeping in the building. It made sure that the people that wanted to get involved had power to make decisions over what happened at the library. Is there an overarching committee or campaign? Do you see it as a problem running a “community Library” without paid staff or council finance? Yes we have an assembly on Mondays where we discuss, we feedback from outreach events and the proposals group and we discuss where we are at the moment and what things we should be doing. The Proposals Group works on a proposal to present to the council. There’s a community bid, and the other approach is that the council should reopen and fund it as well. As you say it has caused a little bit of controversy. The Council’s pulling money out of the library, do we want to be replacing that by volunteers? And in one sense the answer’s “No”, but I think people don’t have a problem with working to keep open a library, but they do have a problem with working to save a council that doesn’t care about services so its trying to find a balance. It is a problem. In Lambeth for example they are trying to turn at least one library into a community library which means cutting the funding and giving people grants which are much lower than the original budget. Then they say “over to you” for the community to run it with no long-term commitment at all. This means they are basically gradually offloading services on to the community to provide. They call it the “Cooperative Council” in Lambeth. Cameron calls “the Big Society”. But in Barnet they’re actually trying to sell the libray building aren’t they? Yes they want to raise money. They want to sell the building and there’s a rumour that they also want to sell the green spaces either side in a package deal to a developer so that will probably by pushing on £1 million. The building’s just been locally listed a week ago but it doesn’t really stop them from selling it on but it’s just something else to help. So what do you think is going to happen at the court case on 17-18 December? It’s very up in the air. With these kind of cases where it seems obvious to anyone who looks at the situation that we’re in the right. If its just down to a point of law, whose the rightful owner of the land, we don’t really have much of a case. We’re never going to win the case that we are the rightful owners but what we can do is delay and one of the things that the council hasn’t sufficiently done is prove that they actually own the land. The deeds that they provided are very old, very sketchy. We’re also going to challenge the fact that they say they didn’t give us a licence to stay here. Because they met with us time and time again. Gave us different options. They were very keen on getting us into the Arts Depot round the corner and getting us to start a library up there and so they entered into negotiations from day one. That really is an implied licence as far as we’re concerned. The council cabinet was occupied this week wasn’t it? When they tried to push through the One Barnet plan? the first part of the One Barnet programme outsourcing to Capita. They’re not 100% sure because they haven’t read the contract but it looks about a £320 million contract given to Capita to run a lot of services. The entire thing is £1 billion. But the £320 million to Capita was voted through on Thursday night. What happened was that there were public questions from residents. The questions were avoided in the usual manner by councilors and towards the end the residents decided that, in their words, it wasn’t a democratic process and they decided to take over the room where the meeting was being held. The councillors had to leave and go into another room and a forum was held by protesters. There was a big discussion on what the next steps should be. What demands Barnet Alliance should put on the council and what kind of direct action. It was quite inspiring. I was there, it was really beautiful to watch because it’s been a campaign that’s gone from very classical kind, using petitions, lobbying politicians etc to taking direct action and really upping the ante a little bit. So 17-18 December court case is a really the crucial date? Yes. Even if we lose we can appeal so we’re definitely here for Christmas unless the judge doesn’t give a stay of execution which would be surprising. But we want a lot of people to come out on 17th and 18th to support our fight. We could have hundreds outside the court house which is going to make a big impression. Although they don’t make any difference in law they do tend to sway the magistrates’ opinion on how they’re going to deal with the case. Which is sadly the opposite of what the council is bringing to libraries, though some of them may have bought their own misleading rhetoric which is as positive as can be. The meeting was called by library staff to talk about what has to be done to preserve and improve our libraries in the face of the reports released on Monday wrapping up years of public consultations. While it is fairly certain that few people have actually read the reports — the size of large encyclopedia volumes, their faded text product of a failing photocopier — the summary from devoted library staff who have read them is that they say very little. “Punching at clouds” is a direct quote. Very heavy, impossible to read clouds. The clear result of the consultation, however, is that people want to preserve all of Lambeth’s libraries, and they want professional librarians to run them. This does not mean they don’t want to be involved in libraries or volunteer in them, but they do not want to manage them or try to poorly cobble together an inferior service as a last ditch effort to save something so important to our community. It is a service that should be provided and paid for by the council from our taxes. The stakes in this struggle are clear. Libraries are one of the great equalizers of our society, no? The place where poor and working-class kids can access books, learning, quiet time for themselves. While some people pretend that the technology gap in our society doesn’t exist, the libraries have been proving it wrong as kids come in to use the computers to do their homework and explore their world. The point was made that for disabled people, mobility is a huge issue, yet almost everyone lives within a mile of their local library branch. This is a safe place for them to come and be part of the community, and they have just managed to ensure that all library computers will be installed with the software making them accessible to the blind. Shutting down libraries is an attack on the poorest and most vulnerable residents in our community, but because they are one of the few places providing services for all levels of society where different people meet and mingle, their loss will have a large impact on all of us, no matter where we stand. Local governments closed 10% of libraries across the UK in the past year, and the future looks even bleaker. the fragmentation of library administration, which both sets branches and neighborhoods into competition with each other for funding, while also making it easier to privatise or sell individual branches in the future. The suggestion that libraries will be converted into ‘community hubs‘, which invokes the possibility of a few books on a shelf and a few self-service machines counting as a library service. This could also serve to pit community organizations who need funding and space and see community hubs as an opportunity, against those wishing for libraries to remain fully staffed, fully funded, and with a full complement of resources and books. Management reports making clear that 10 staff positions will be lost to help pay for the new self-service check out machines, but that has been nowhere stated in this report or public discussion. Originally, the machines were to have been brought in to free up librarian time to work with community and focus on additional programming. A beautiful dream now lost. The problem of staffing is already a large one. On Sundays only four staff are working in the beautiful and very big central Brixton branch. Not enough. At least we are still better off than the village libraries of Cambridgeshire. They have cut staff so severely there is only one person working in the library at any given time, so in the interest of safety each library now has a strong room where the librarian can escape to in case of any trouble, bolting the door and calling the police. Possibly a great new plot for Jodie Foster to work with, but hardly a way to run a public resource. There are also two discussions on that would in effect result in the loss of libraries. One is a proposal to move Streatham library off of the main street and into Gracefield Gardens, which everyone agrees would effectively kill it. The other has been the ongoing discussion of what to do with West Norwood library, putatively closed since its roof was stolen. The council neglect to say that the beautiful copper roof was in fact stolen over a period of ten days, and while it was reported to them they hired no security and took no action. They have spent £780,000 on repairs and could have reopened the library long ago. It turns out that most of the money was spent not on urgent structural repairs, but upon building a separate entrance to Nettlefold Hall, which contains a cinema. It also turns out that one of the “community partners” being claimed by the council and interested in buying the West Norwood property is a private picturehouse company. This seems to show a bit of planning on the part of the council, a clear intention to unload services and sell off valuable real estate. That is the bottom line, underneath all the rhetoric of cooperation and consultation. They are trying to sell off public property and stop public services, which is why we are standing up to stop them. A number of suggestions came out of the meeting about what to do next. There will be a delegation to next week’s council meeting, a petition, and a broad campaign not just to save our libraries, but to ensure the council funds libraries to provide the services we need. More will be coming soon with what you can do and how to get involved! We must protect our libraries from cuts and closures. We must force the council to invest in books and buildings and staff to make a library service that Lambeth deserves. Click here for the Library_Leaflet, we hope to see you there! 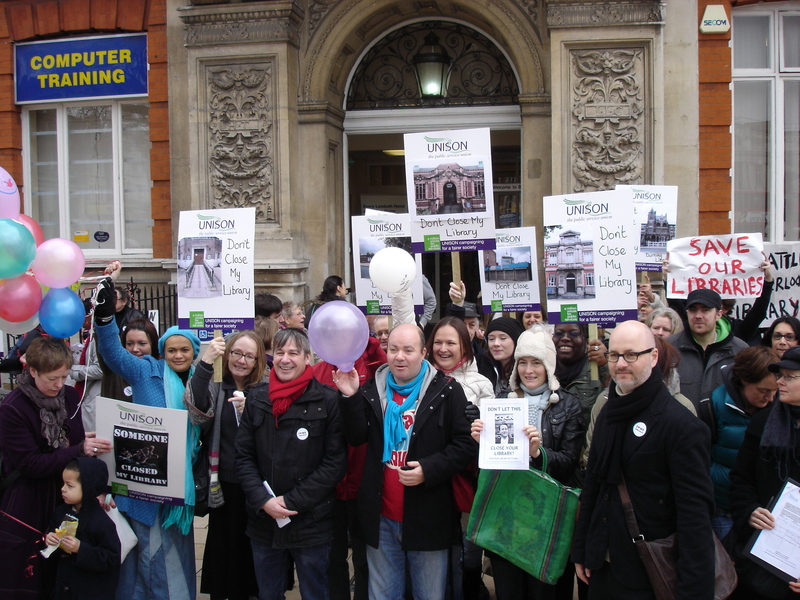 Libraries strike suspended – victory for jobs and services! 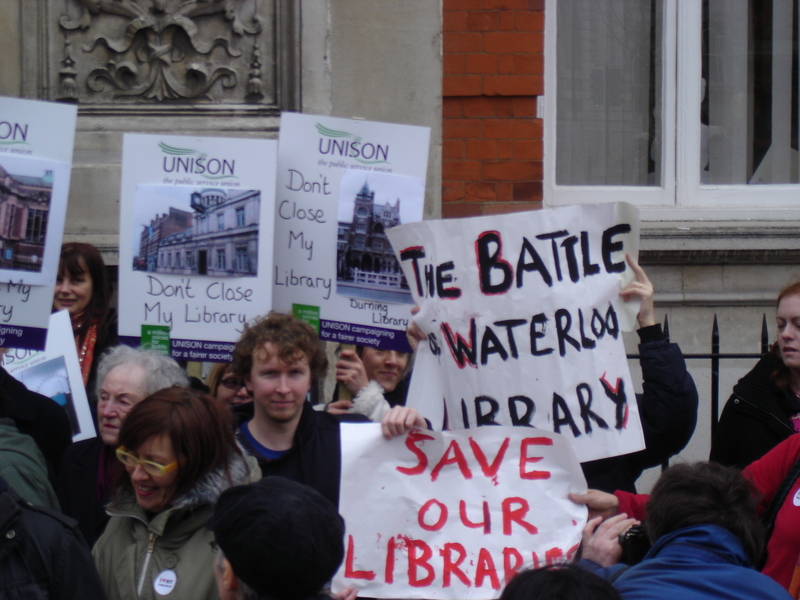 Strike action planned to close all Lambeth Council’s libraries on Friday 22 July will not now be going ahead as the council management conceded that there will be no compulsory redundancies in an offer put to the union today. The latest management offer will be put to all UNISON members in Libraries at a joint shop meeting on Monday. No deal can be made before it is discussed and agreed by members in Libraries and you can not rule out industrial action to protect the service, but management’s offer represents a significant victory as it protects both jobs and many frontline services. This is a tribute to the unity and determination of trade union members in the libraries, who were ready to strike to defend the library service and protect their jobs. This is a lesson to every other worker – in Lambeth Council and elsewhere – that to look after your interests you have to be prepared to take industrial action. Alongside Children’s Services supporters at Wednesday’s council lobby will be the Save Lambeth Libraries campaigners, lobbying the council not to axe Lambert’s Library Staff. Libraries are undergoing both a consultation on the future of libraries and a staff restructure (why are these not part of same program Lambeth?!) 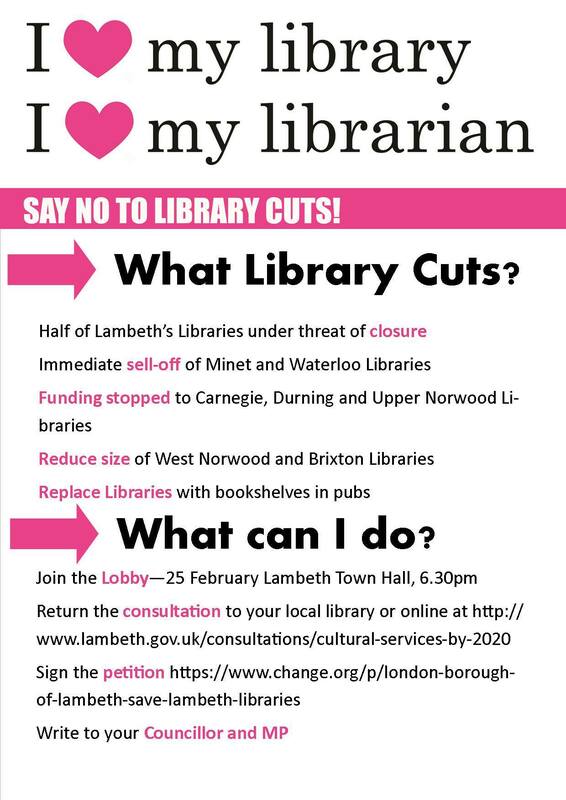 and Lambeth’s library workers and librarians are opposed to the huge cuts proposed by the council – staff cuts, reduced opening hours, de-professionalisation of librarians, possible closures, “community trusts” (cuts with glossy image?) and more. How can you help? 4 things to do this week! 23 FEB – 6PM- COUNCIL CUTS BUDGET VOTE- DEMONSTATE, PROTEST & LOBBY! On the 23rd February Lambeth Council meets in full to vote on its proposed budget and we, Lambeth Save Our Services, will be protesting against it, just as we did on the 7th February when hundreds protested at the last cabinet meeting. Maintenance of the borough’s parks, cemeteries and crematoria is to be scaled back. Reduction in the Faith Engagement Programme, which helps to support events such as Holocaust Memorial Day and Peace on the Streets and other community events and projects. Most importantly Lambeth SOS believes that our local democratic representatives – councillors – should not implement government cuts they openly disagree with. Lambeth Labour, who run Lambeth Council, admit that the government cuts to the budget are ideological. We agree – these are cuts made by a Conservative (and Liberal) government made up of millionaires who believe huge public service cuts and big business are the way forward. Today Lambeth Save Our Services supported the Friends of Libraries groups and Lambeth UNISON at a Save Libraries protest in Brixton. Children drew a beautiful Save Our Libraries picture in chalk on Windrush Square and a balloon was released for each letter of the alphabet. 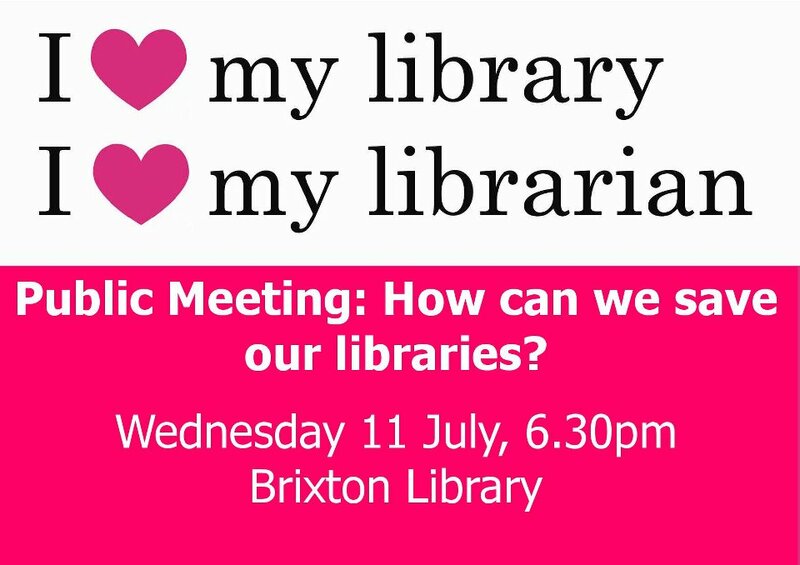 Speeches about the importance of libraries were made by Tim O’Dell the local Unison rep, Toby Litt a local author, Vanessa Wood Chair of Friends of Brixton library and members of Children’s Writers and Illustrators Group. The protest was well attended and had a lovely atmosphere with children playing and home-made banners. Letters to councillors were busily drafted and testimonials gathered to teach the council the value the people of Lambeth feel libraries add to the community. 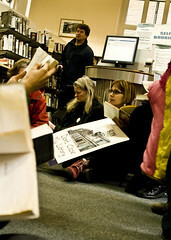 After the speeches a large group of the protestors went into the library, picked up a book and began reading. There was not enough room so most simply sat on the floor. Having never been to a ‘Read In’ before I have to admit there was something pretty magical about it. Carnegie Library in Herne Hill Road, Herne Hill. A consultation is to be launched in April to discuss the future of the borough’s libraries. In the pointless budget consultation meetings finance councillor Paul McGlone said he thought a couple of years was enough to put all the libraries into a community trust as part of the Big Society “Cooperative Council” program so that then the community would own them. (Usually they announce that after the libraries consultation no eh?) Accept he seems to have forgotten that the community already owns libraries – that is why we have local councils and council tax. 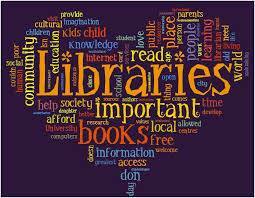 Libraries are the absolute front line of communities, where else can children do their schoolwork, homeless people use the internet, people go and read and exchange ideas free of charge? Where can community groups meet for free – those same groups the council so desperately want to involve in their Co-operative Council? Libraries are the closest local council service most people have, and they deliver a fantastic service on a tiny budget. What they need is more staff and more money, not a cuts program with a glossy Cameron style cover.